Cataract is a condition of the eye in which clouding of the eye lens occurs. This eye disease affects the normal vision of the individual. 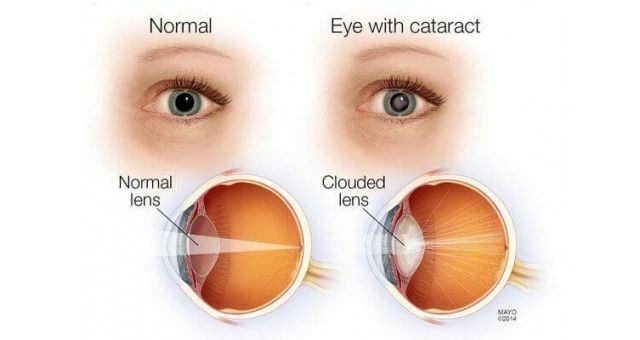 Cataract is basically an age-related condition which is usually seen in older people. 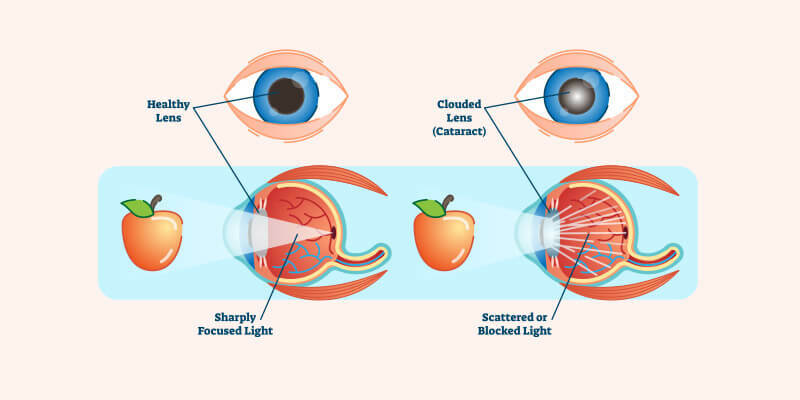 Clouding of the lens can occur in one eye or both eyes though it cannot spread from one eye to the other. Cataract hampers the day-to-day activities of the individual due to poor vision. Proteins and water are the main components which form the eye lens. The specific arrangement of these proteins makes the lens clear and allows passage of light. This light falls on the retina which converts it into a nerve signal and sends it to the brain. With ageing, the proteins of the lens may undergo clumping/ degeneration, leading to blockage of a passage of light, hence affecting vision. (Figure 2). This clouding can occur on a small part of the lens, or the entire lens can get affected depending on its severity. Cortical Cataract: In this type, the clumping or clouding occurs in the form of wedges around the edges of the nucleus of the eye lens. Posterior Capsular Cataract: As the name suggests, this type of cataract affects the back of the lens. This type of cataract affects vision faster as compared to the above two types. 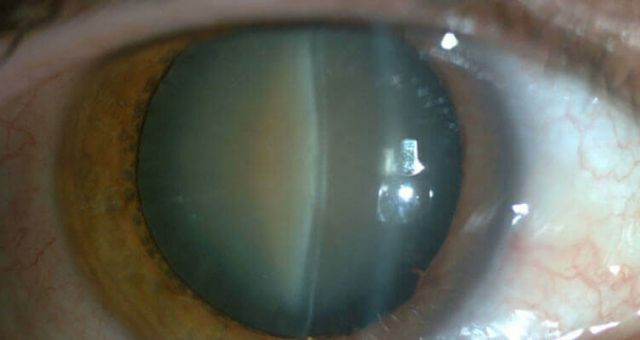 Congenital Cataract: This is one of the rare types of cataract. It is present from the childbirth stage or is caused during the first year of baby’s development. Secondary Cataract: This type of cataract is due to some disease or medications. Diseases like uveitis (inflammation of the eye), glaucoma (optic nerve damage due to high eye pressure), etc., cause this secondary cataract. Some medications like the use of prednisone (which is a steroid) may lead to this type of cataract. Traumatic Cataract: Traumatic type of cataract occurs due to some injury or trauma caused to the eye. In case of this type of cataract, clouding appears after some duration of time. Radiation Cataract: The name of this type of cataract says that it occurs when the eyes get exposed to radiation for a longer period of time. It occurs in patients who undergo radiation therapy for the treatment of cancer. Figure 3. 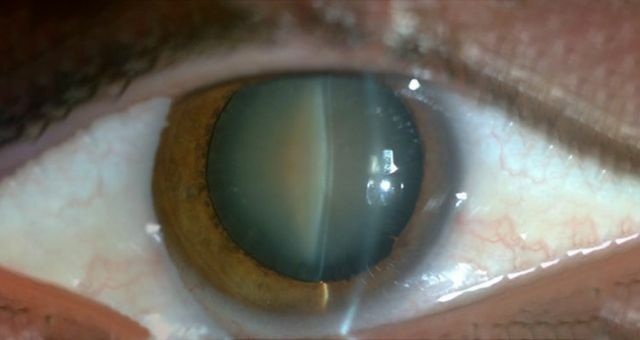 A typical age-related nuclear cataract. Frequent changes needed in the contact lens or glasses presciption, etc. Prolonged exposure to radiation, etc. Visual Acuity Test: The first and basic symptom of cataract is a blurry vision. Ophthalmologists check the patient’s vision by making him/her read the letters from a specific distance. Slit-Lamp Examination: In this test, the ophthalmologist uses a special microscope through which he/she observes the different parts of the eye. The ophthalmologist checks the cornea, iris, and lens. A normal and healthy lens allows the passage of light through it. Any obstruction in this path may suggest cataract. Retinal examination: The doctor puts dilating eye drops in the patient’s eye that helps to widen the pupil. This allows the doctor to have a better look at the retina and observe the extent of spread of cataract. The treatment for cataract depends on the severity of cataract and its effect on vision and patient’s day-to-day activities. Surgical replacement of the lens is the last option which doctors suggest for correction of cataract. 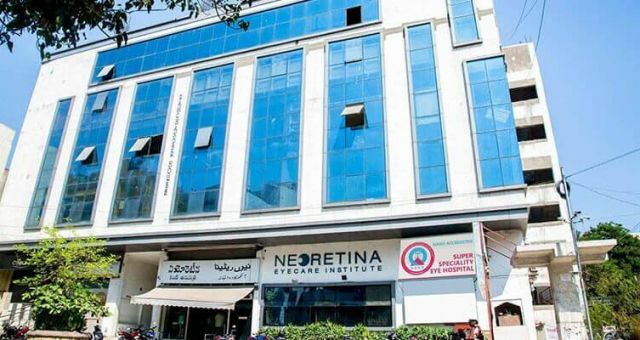 In a reputed eye care clinic like Neoretina Hyderabad, we suggest different strategies which an individual can opt-in cases of early cataract when vision and day-to-day activities have not been affected yet. Following options are available for such early cataracts. Surgical replacement of the cataractous lens is the final treatment. It is a short duration surgery done under local anaesthesia where cataract is replaced with an intraocular lens. Cataract surgery is the safest surgery in the world, and gives excellent results when patients present to the doctor in time. Thus, timely consultation can help transform how you see the world. If cataract affects your quality of life, then specialists surgeons can perform advanced microincision cataract surgery and help you see clearly. Dr. Abhilasha Baharani is a specialist in Uveitis and Ocular inflammation. Her areas of expertise are Uveitis & Ocular Immunology- management of ocular tuberculosis, immunosuppressive therapy for non-infectious uveitis & scleritis, phacoemulsification in small pupil, complicated cataracts and ocular manifestations of systemic diseases. She studied MBBS at Kasturba Medical College Mangalore and DNB at Aravind Eye Hospital & Post-Graduate Institute of Ophthalmology, Tirunelveli. She did her fellowship in Uveitis & Ocular Inflammation at Aravind Eye Hospital & Post-Graduate Institute of Ophthalmology, Madurai and a second fellowship in Ocular Inflammatory Disease in Vitreoretinal Disorders at the Royal Victoria Eye and Ear Hospital, Dublin, Ireland where she became well-versed with newer immunosuppressive agents and use of biologic blockers. She is a member of the International Ocular Inflammation Society and is an active member of the state and national academic societies. 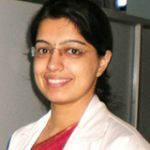 She has received the Carl Herbort Award for her research paper at the Uveitis Society of India Annual Meeting in 2012 and Award of Distinction and Award of Merit for her research papers at the International Ophthalmology Congress- Innovations and Challenges in Glaucoma & Uveitis, Singapore, 2014.